What are you allowed to bring onboard? 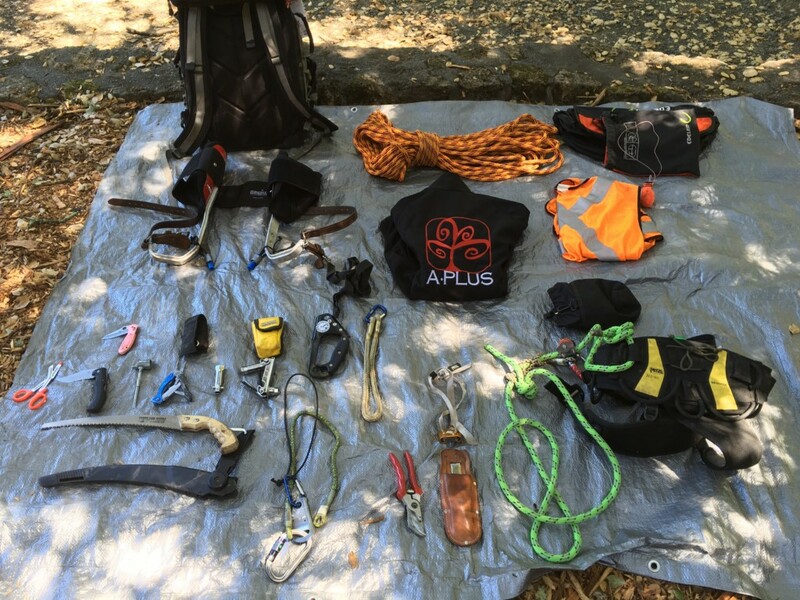 On a mission to work in the urban forests of Seattle, I asked myself these questions as I packed my gear bag for my flight out of San Francisco. I expected to drive the trucks, climb some trees and do some ground work. The challenge was to pack the essentials, yet stay within the airline's baggage limits. I couldn't find any resources online on how to pack an Arborist gear bag for a flight. There were a couple of rock climbing forums that discussed quick draws and anchors, but that was it. So, I had to roll up my sleeves and get to work. My goal was to have one check-in bag and one carry-on. For most airlines, the check-in bag must weigh less than 50 pounds, and the carry-on must weight less than 16 pounds. 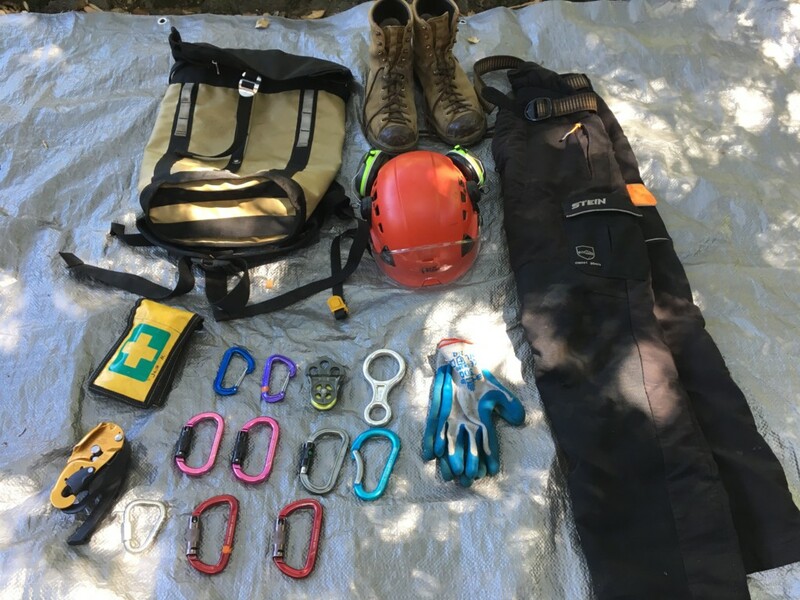 My first step was stripping down my gear to the bare essentials. I tossed out my extra loop runners, a false crotch with steel rings, etc. In the end, I packed my Petzl Rig with a rope walker setup, since it's the most versatile setup for my style of climbing. With this gear, I could also configure a RADS (Rapid Ascent Decent System) setup. I also packed my Hitch Climber pulley with a prusik for MRS as a back up climbing system. I packed the bulkiest items such as my climbing line and jacket into my check-in gear bag. I also packed tools that are prohibited from carry on bags. If the TSA doesn't allow scissors on board, I want to be sure of what I can carry. But, the list is not all inclusive and can be subjective. I ditched my favorite 1/2" (13mm) climbing rope and packed my 11mm rope. It is the smallest diameter rope that is allowed for a MRS system as per ITCC safety regulations. It also fits in my Petzl Rig so I can use it for SRT as well. I would have packed my top handled chainsaw as well, but aviation regulations are strict about transporting anything that uses fuel. Some airlines may allow chainsaws if the oil and fuel tanks are drained. However, the fuel vapors could be construed as hazardous so I didn't want to risk losing my saw at the airport. I decided to take my carabiners and my Petzl Rig onto the plane with me. All of that hardware is heavy for its size. I wanted to split the weight between my two bags. Also, shiny carabiners are prime targets for thieves so I wanted to have them with me. I was a little worried that they wouldn't make it through security, but they did! So carrying several carabiners with a Petzl Rig worked for me. I also brought my climbing helmet with me to save space in my gear bag. And I didn't want my helmet to get crushed by luggage handlers. Another loophole I found: There is no weight restriction on the clothes you are wearing. So I wore my chainsaw pants and work boots onto the plane! In the end, my check-in bag weighed 19 pounds, which included my clothes! And my carry on bag was only 8 pounds! So I had plenty of room if I needed more gear. I would say that my setup is as barebones as I can make without sacrificing efficiency. And while the TSA is certainly restricting, you can still bring on a surprising amount of gear. Can I use this in more than one way? Does this save me time or effort? Safe climbing and travels all!